Respite care typically refers to a short-term stay at a senior community, usually an assisted living or memory care community. Respite care is a great living option for an elderly or disabled person who needs some day-to-day supportive services, but still desires social stimulation, engagement and activities. Because of the high stress associated with caring for a loved one with a memory disorder, respite is frequently sought by the family of people with Alzheimer's or other kinds of dementia. 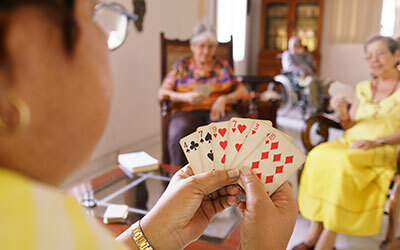 Family caregivers use the opportunity to "recharge their batteries." At Carveth Village, we provide a customized solution for a two week period of time where the individual who is staying at Carveth will feel right at home with all of the other residents. The individual will receive their own room, be able to participate in all of the activities, and enjoy the same luxuries as everyone else, without having to sign a long term contract.